Apple's new Magic Trackpad offers desktop Mac users a multitouch trackpad alternative to the mouse, designed to match its super slim aluminum keyboard. The Magic Trackpad follows Apple's introduction of the Magic Mouse last year, which was similarly launched alongside a new batch of iMacs. New iMacs continue to ship with a Magic Mouse by default, leaving the new trackpad a $69 accessory (not an upgrade; if you buy one, you still also get a Magic Mouse with your order). New Mac minis ship without a mouse, while Mac Pros ship with a wired mouse; neither product currently offers the Magic Trackpad as a bundling option, but the new trackpad works with any modern Mac capable of running Mac OS X Snow Leopard 10.6.3. The Magic Trackpad isn't Apple's first trackpad for desktop computer; the company bundled an external wired trackpad with the Twentieth Anniversary Mac, a limited edition model that shipped in 1997. That $7,500 system was built from spare notebook parts, so it made sense that it shipped with a trackpad that optionally embedded into its keyboard wrist rest. Beyond that experimental venture, Apple has shipped Macs with a mouse, which offers greater positional accuracy than the first trackpads. However, the new technology being invested in notebook systems has made the flat surface of the trackpad more competitive with a freely positionable mouse. Apple began pioneering multitouch pinch, swipe and rotation features on its MacBook trackpads with the MacBook Air in 2008. The latest MacBook models include a variety of two, three and four fingered gestures, including two fingered secondary tap, inertial scrolling, pinching and screen zoom, three fingered swipe navigation or window dragging, and four fingered invocation of Exposé and app switching. Progress on the mouse front has come slower, with Apple offering little more than a simple pointing device until the Mighty Mouse appeared in 2005 with a roller ball and three other programmable buttons. Last year's Magic Mouse added a subset of multitouch gestures recognition via its new touch sensitive cover. However, a variety of trackpad gestures simply can't translate onto the back of a mouse, or would be to clumsy to perform. 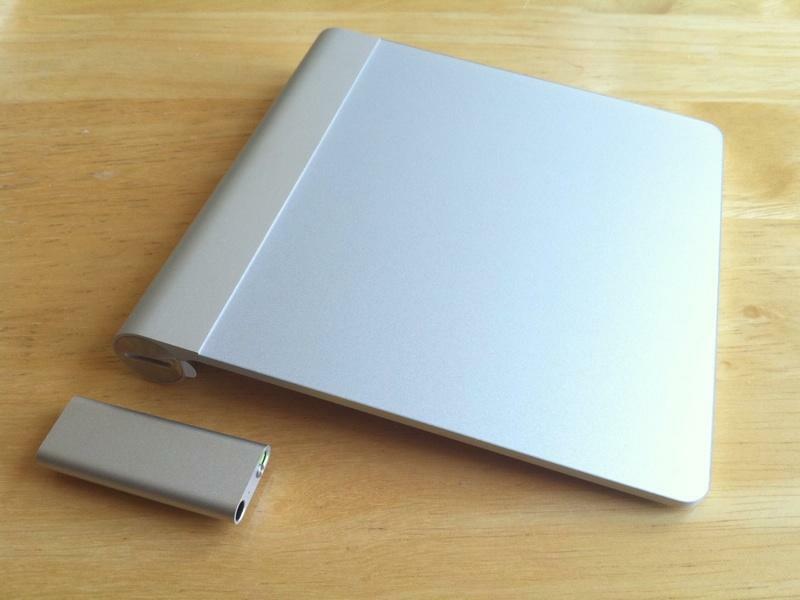 The new Magic Trackpad presents a full featured external trackpad with feature parity with its notebook siblings. The primary difference is that it's larger, with 80% more surface area. Magic Trackpad takes up about the same hand-sized amount of room as a mouse, but you don't need to move it around, so it might be preferable to use if you have a limited amount of desk space next to your computer. Like the matching Apple Wireless Keyboard, the new Magic Trackpad is a thin aluminum surface propped up at a slight angle on its battery compartment. 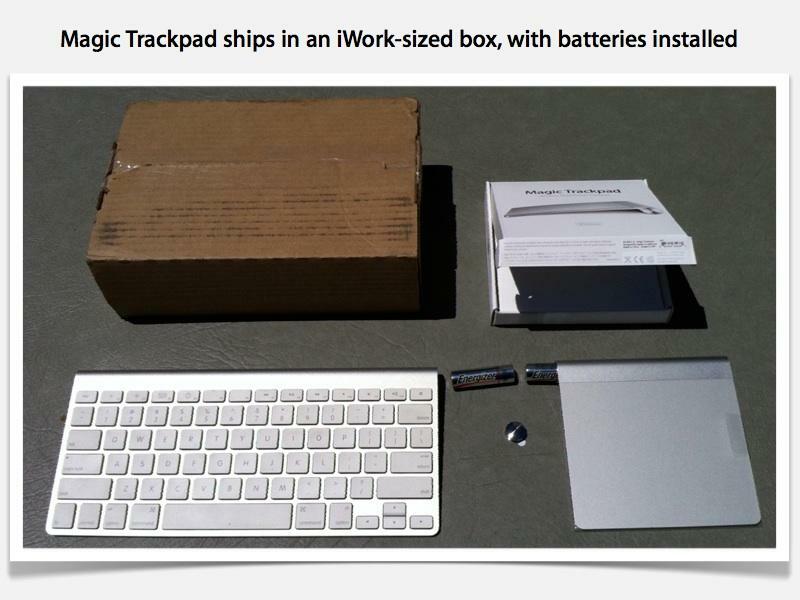 It ships in a very small box similar to iWork, with two AA Energizer batteries installed and ready to use. 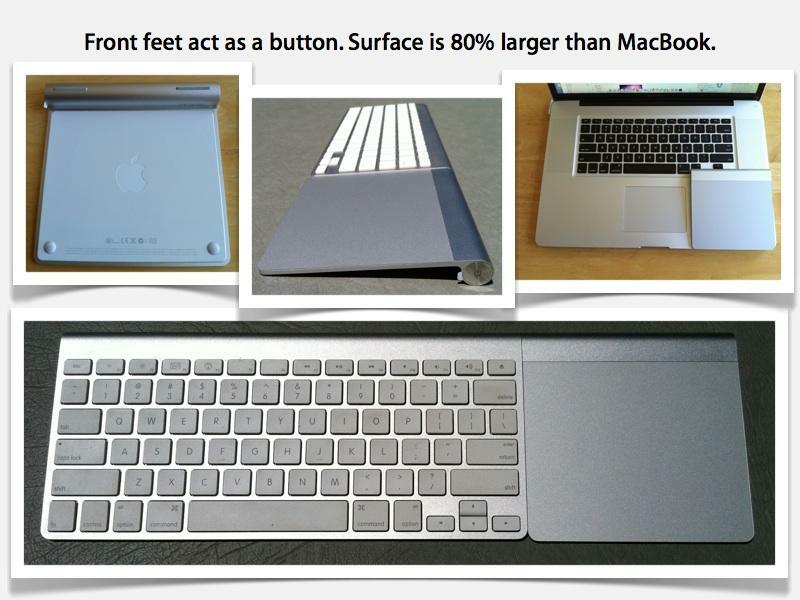 Similar to the modern, clickable generation of MacBook trackpads, the Magic Trackpad works as a single big button. But rather than being a glass surface that depresses into the aluminum shell of the MacBook to click, the external trackpad's buttons are its front two feet. This allows you to both lightly tap on its surface, and to press down to register a click, which you can feel and hear. On page 2 of 2: Easy setup, familiar to use.